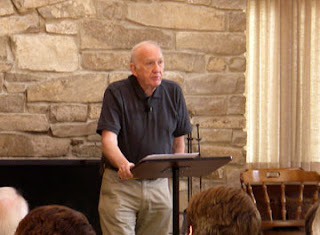 The Blog of Dr. T. Michael W. Halcomb: America's Greatest Exegete: Gordon Fee? Well, that's what Bryan, Stephen and Shaun say. Andrew Bourne suggested the late Catholic exegete Raymond Brown but nobody seconded that motion. So (according to a few people at least), it seems that Fee (pictured to the left) is the greatest American exegete? Agree? Disagree? Hey I think I was at that event that the picture of Fee was from. It was awesome!! Since the greatest is already taken who would be 2nd or even 3rd greatest? Luke Timothy Johnson? Richard Hays? Paul Achtemeier? Dale Allison? I would vote for Brown and then maybe would put F. F. Bruce next, perhaps, but I do not intend this as in any way a denigration of Fee. I just think that the breadth of the texts and subjects on which the former two have published might give them a lead. But all three (and presumably others as well) are great exegetes, scholars whose writings one recommend without hesitation.